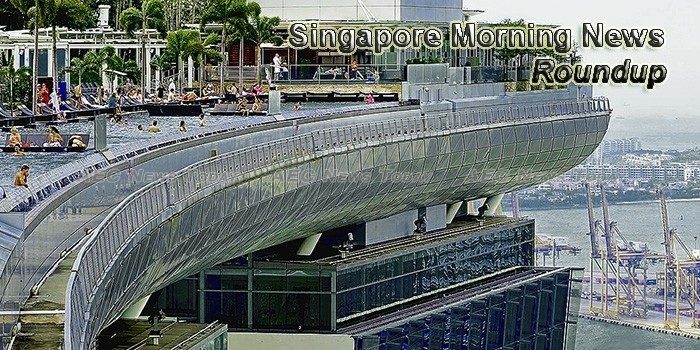 Singapore morning news by AEC News Today is your one stop source for Singapore news on matters of governance and policies affecting Asean business communities. Singapore topped the list of countries where rich Indonesians stashed money and assets, according to figures on the country’s tax amnesty programme from its finance ministry this week. SINGAPORE Changi Airport handled 4.67 million passenger movements in February 2017, up 1.5 per cent from a year ago. Country must be prepared for jobs and middle-class white-collar wages to be affected, says Singapore’s smart nation minister, as he reveals plans for 10,000 government employees to be trained in data science. Two cases of locally transmitted Zika virus infections have been confirmed at Simon Place in Hougang, the National Environment Agency (NEA) said on Wednesday (Mar 29). The Singapore stock market has finished higher in two straight sessions, gathering almost 60 points or 1.9 percent along the way. The Straits Times Index now rests just below the 3,185-point plateau, and the market may see continued support on Thursday. The Economist’s Intelligence Unit recently published its list of the most expensive cities on earth, and once again Singapore has landed on top of the world. YPO, the world’s premier peer network of chief executives, announced today that Singapore will be the host city for YPO’s flagship event, YPO EDGE, bringing more than 2,700 young business leaders and delegates to the city in March 2018 and marking the second time Singapore will host YPO’s landmark annual event. Electronics giant Samsung on Wednesday (Mar 29) threw the covers off its latest flagship smartphone, the Galaxy S8, with much of its fortunes – at least in the mobile phone space – riding on it being a hit with consumers. Some 230 countries retrenched workers were able to find jobs since the start of the year, through the help of the Taskforce for Responsible Retrenchment and Employment Facilitation. The National University of Singapore (NUS) will provide data science training to 2,000 public officers annually, under a new memorandum of intent (MOI) it signed with the Government Technology Agency of Singapore (GovTech) on Wednesday (Mar 29). The Bahrain Economic Development Board (EDB) inked a partnership with fintech incubator and ecosystem builder Singapore Fintech Consortium (SFC) to establish a fintech ecosystem and regulatory framework. Indonesian stocks hit a record high on Wednesday while Singapore shares climbed to their highest in nearly 20 months as data showing strong U.S. consumer confidence boosted sentiment in export-reliant Asian economies. After trying out the new JustGrab service launched for beta-testing a week ago, cabbies said they would be more judicious about accepting such bookings, noting that they are less profitable. At Kallang Distripark in Geylang Bahru Road sits the dull, boxlike shape of a disused rubber factory that has been converted into a warehouse. The Young Presidents’ Organisation’s (YPO) landmark YPO EDGE event, which brings together more than 2,700 young business leaders, will be held in Singapore next March. The national customer satisfaction score in Singapore rose to 71.8 points in 2016, driven by increases across all sectors except Logistics and Private Education, data from the Customer Satisfaction Index of Singapore (CSISG) showed. A new report by KPMG and CPA Australia on Singapore family businesses found that 93 per cent of business founders surveyed said continued profitability was more important than preserving their legacy. A Malaysian businessman staying at Hotel Boss in Jalan Sultan was woken up from his sleep early yesterday morning by the commotion in a room nearby. Singapore morning news is published M-F by AEC News Today: Governance, not government; policies not politics.